Disgraced President of Ghana Football Association (GFA) Kwesi Nyantakyi has resigned from his roles at the FIFA council and CAF executive committee. The move comes after he has been captured on video allegedly accepting a $65,000 gift to participate in facilitating meetings with Ghana president Nana Addo Dankwa Akufo-Addo. The film shows him apparently placing in a black plastic bag the $65,000 he received from a reporter pretending to be a businessman wishing to invest in Ghanaian football. 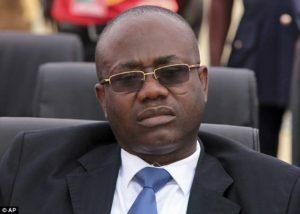 The Ghana Football Association President was the First Vice- President of the continental body and FIFA Council Member. His resignation was revealed by the President of the CAF, Ahmad Ahmad ahead of the opening of the 2018 World Cup finals in Moscow, Russia. CAF announced that it will hold a vote at an Extraordinary Congress on 30 September 2018 in Egypt to fill the CAF 1st Vice-President position and the vacancy on the FIFA Council. He further told the federations that candidates will come from the English-speaking group in the Confederation of African Football. FIFA has not yet commented on whether any action will be taken over the Ghana government’s plan to dissolve the soccer body. Posted by Emmanuel Agbenonwossi on June 12, 2018. Filed under Zoom. You can follow any responses to this entry through the RSS 2.0. Both comments and pings are currently closed.